Before getting to the many details that go with the table, let me proclaim my own strong interest in ActiveCaptain applications and also describe what led up to the current situation. Fourteen months of cruising in unfamiliar waters made me a believer in the value of the AC user community (before Garmin capitalized the ‘c’). 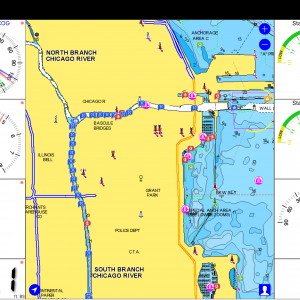 Garmin BlueChart Mobile overlaid with AC POIs became an indispensable navigational tool at my helm. Because we were almost always in waters I hadn’t cruised before, the experience of others, shared via AC, helped guide us through sometimes challenging cruising. I experienced the great value of having AC information displayed in an easy-to-consume app. 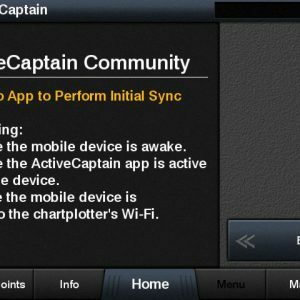 As we’ve discussed previously, there has been plenty of confusion about changes to ActiveCaptain since Garmin’s acquisition. We learned that a change was required in order to comply with the EU’s General Data Protection Regulation (GDPR). The AC application programming interface (API) — the mechanism used for exchanging AC data with apps and software packages — would be replaced with an ACC version able to support the more robust privacy controls GDPR requires. The new ACC API requires software developers to modify their code as well as accept new legal terms. Those new legal terms may present challenges to existing and potential ACC partner developers. 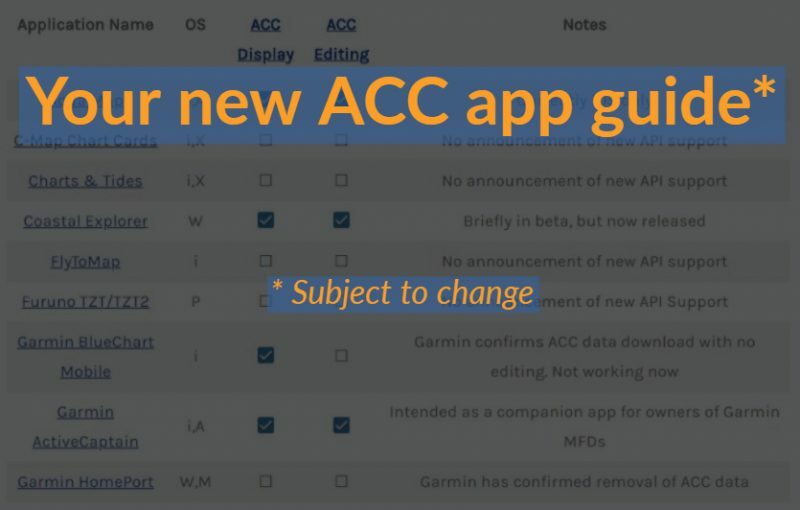 Meanwhile, Garmin improved access to ACC with an important change to the ACC API. Previously any interaction with the AC database required logging in. So, to download the POI database you had to provide your AC username and password. Now, an app can let you view the ACC database without logging in (“ACC Display” in the table above)! Authentication is only required to add, edit or delete POIs (“ACC Editing “in the table above). I think this is an important change and one that may well significantly increase the use of the ACC data. If managing accounts isn’t required to download the data users are more likely to have current data available on their apps. Each positive experience a user has with ACC makes them more likley to contribute to the data they’re using. The strength of any crowd-sourced data comes from use and updates of the data. I like the change Garmin has made here and hope it will help contribute to more frequent updates. This is the starting point for most users of ActiveCaptain. You register your account or migrate your old one here and then can launch into the map and begin to interact with ACC from here. Ben Ellison has done a thorugh write-up of the new site. Aqua Map has worked quickly to make the needed updates to their iOS application to support the new ACC API. 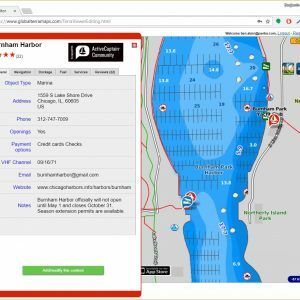 Garmin rolled out their changes later in the day on 5/23 and by the next morning Aqua Map announced on the ActiveCaptain Facebook group they had released an update to the application to support the new API. The initial support was for display only which doesn’t require login. Since then another iOS app update has been released that includes support for logging into the API and adding ratings and reviews. The next update will allow making additions and edits to the data. 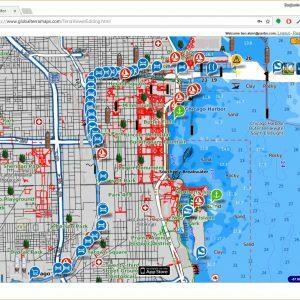 7/10/2018 – Aqua Map has released an android version also fully supporting ACC. New 6/15/2018 – The Aqua/Terra Map free Web Viewer now supports ACC as well. You must visit https://www.globalterramaps.com/TerraViewerEditing.html (http won’t work) to see the ACC POIs. ACC markers can be edited using the “Add/modify this content” green button seen on the bottom of ACC entries. Nicely, routes and waypoints can be shared between AquaMap and the free web viewer. 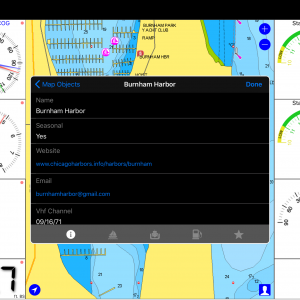 According to Garmin BlueChart Mobile will be able to display the new ACC data. 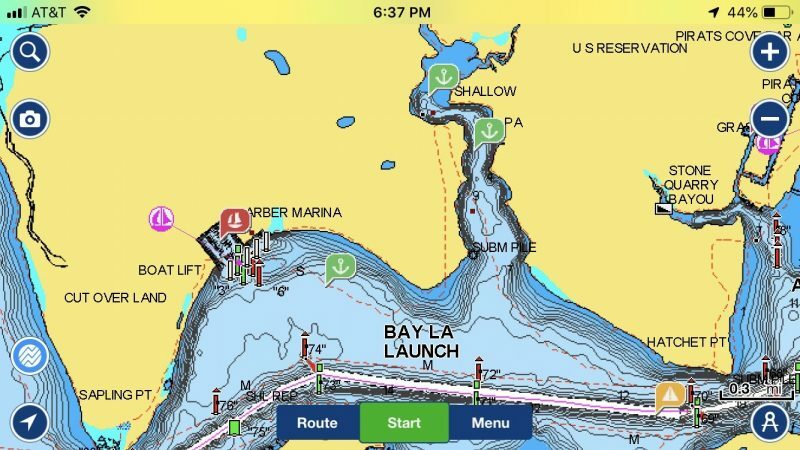 Garmin Announced in the fall of 2017 that BlueChart Mobile was being discontinued, but users would continue to be able to use the charts they’d already purchased. After the release of the new API Garmin published the Q&A above stating BCM would be able to display ACC data. Surprised by this answer, I emailed Ken Cirillo of Garmin who confirmed this is correct. It turns out Garmin has always received the data from the ActiveCaptain servers and reformatted it for their applications. Because Garmin was an intermediary they are able to reformat the new data format and provide it to BCM. If you haven’t already downloaded BCM this won’t help you as the product remains discontinued. Unfortunately, so far I haven’t been able to get this to work, Garmin says they’re aware of the issue and expect to have it fixed very shortly. 6/13/18 – Garmin has sent an email saying they expect to have the issues with Garmin ActiveCaptain and Bluechart Mobile resolved by Monday 6/18/18. 6/22/18 – Garmin has sent an email reporting the previous issues have been resolved. In order to get updates to work Garmin says you will need to log out of ActiveCaptain, delete the data, and then re-download the data. That operation may take up to an hour. Rose Point Navigation completed the software development work on Coastal Explorer needed for the new API prior to Garmin’s 5/23 roll-out and released version 4.0.18142. 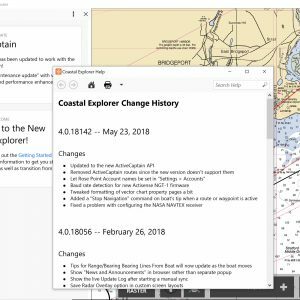 Coastal Explorer fully supports ACC with data downloading, editing and deletion all covered. Edits can be made offline and synced to ACC the next time Coastal Explorer is connected to the internet and synchronized. Ben Ellison made several of the edits to ACC he describes in his piece on ACC’s new website via CE’s new ACC integration. It’s a safe bet that Garmin is going to do everything they can to make sure a product that carries the ActiveCaptain name will support ACC data. There have been some reports of difficulty syncing shortly after the rollout of the new API but Garmin fully intends to support ACC on the ActiveCaptain app. 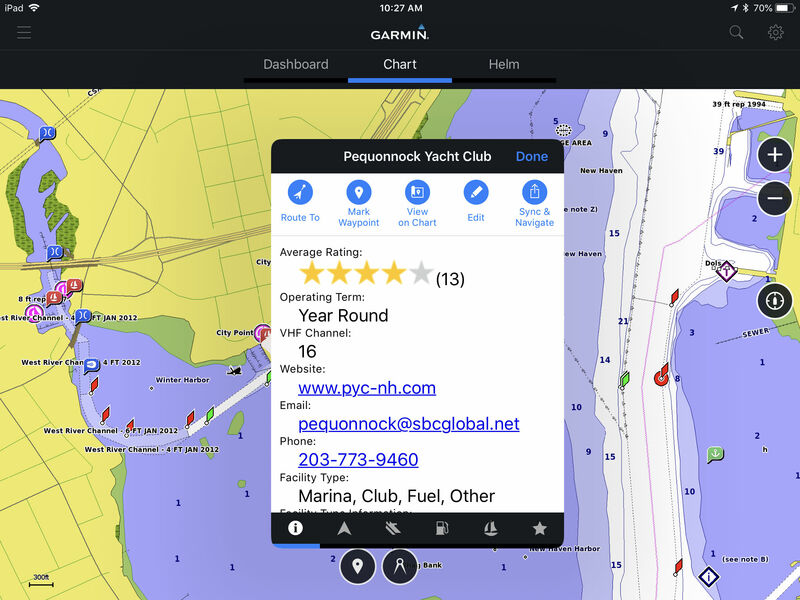 Owners of Garmin MFDs can use the “Sync & Navigate” button shown on the top right of the Pequonnock Yacht Club POI above to have the ActiveCaptain app work with their MFD to route right to the point. The “Edit” button above takes you to the ACC website so an internet connection is required to make edits using GAC. A quick reminder because there has been some confusion about the intent of the app. 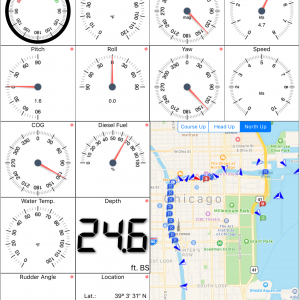 This product is intended to be a companion app for owners of Garmin MFDs –if you own a Garmin MFD charts are free, if you don’t they’re pretty expensive– so, it’s likely if you’re looking for a standalone app to display ACC data there might be better bets. 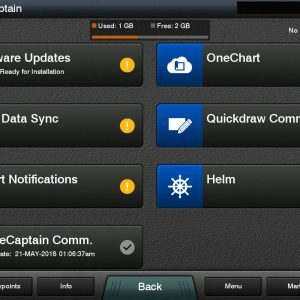 6/22/18 – Garmin ActiveCaptain is now updating data successfully. This one has been talked about since Garmin bought ActiveCaptain. When will we see ACC data on Garmin MFDs? We have our answer and it’s June of 2018. Ben Ellison tried it out as soon as stumbled on it in the release notes. He rushed out to his boat, applied the update and you can see the results below. Tucked in the release notes for version 12 is “Added support for viewing ActiveCaptain Community information.” ACC POIs are displayed as a layer with granular control over which types appear as can be seen in the gallery below. It appears ACC support has been brought to 8600, 8400, 7600, 7400, 1242, 1222, 1022, 942, 922, 742 and 722 MFDs. 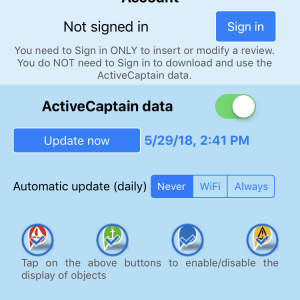 Support is limited to displaying of the ACC POIs and loading that data is done via the ActiveCaptain mobile app which can also be used to open the ACC website to edit POIs. MX Mariner developer Will Kamp commented below that he is working on adding support for display of ACC POIs first followed by a release with full editing support. I’ve emailed Will for more information on timing and will update as soon as I know more. 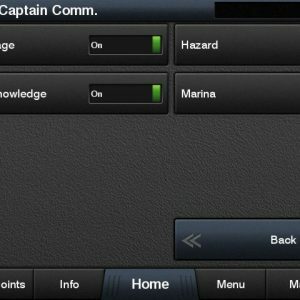 MX Mariner has added ACC support. The version with support is currently in beta but Will Kamp hopes to have it released by the end of the week or early next week. WilhelmSK can claim a few ACC firsts. 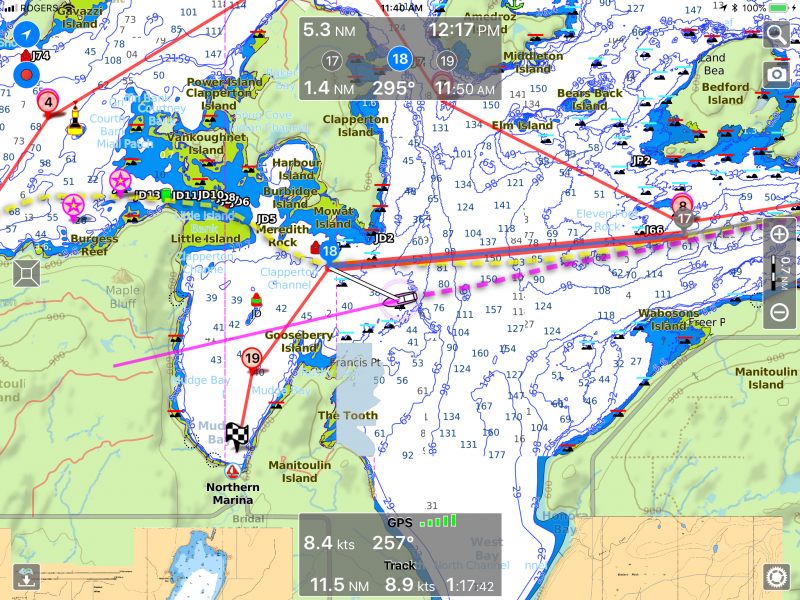 It’s the first app that didn’t support the old API to add support for the new API, but possibly even more significantly, because it supports display of Navionics cartography and can now overlay ACC POIs on all of its charting. 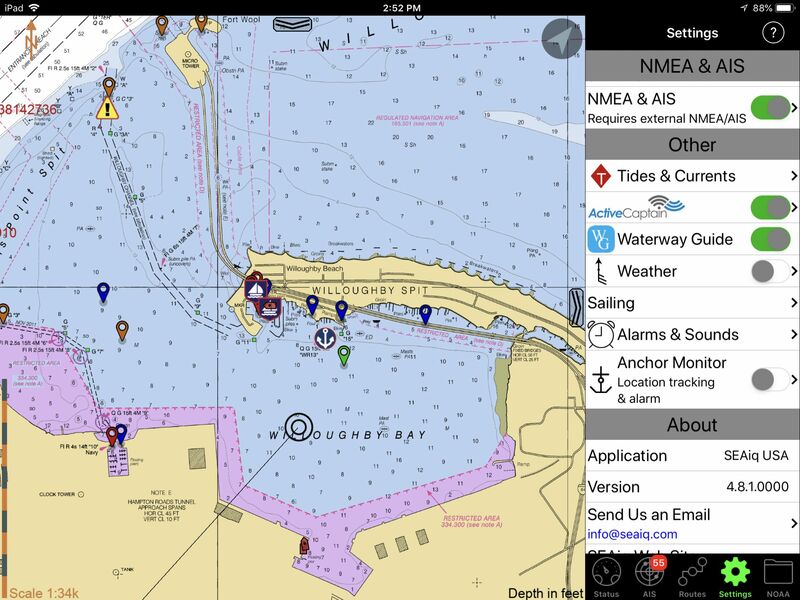 It’s the first app to support AC POIs on Navionics cartography. 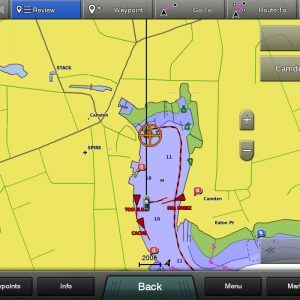 WilhelmSK is an impressive SignalK display app with nice integration with Raymarine MFDs and support for Navionics, Apple Maps and Goolge Maps cartography. The ACC integration allows the ACC POIs to be overlayed on all supported cartography. Like the other apps that have implemented the new API you can download all the ACC info without logging in, but if you login editing, which is currently limited to comments and reviews, is enabled. 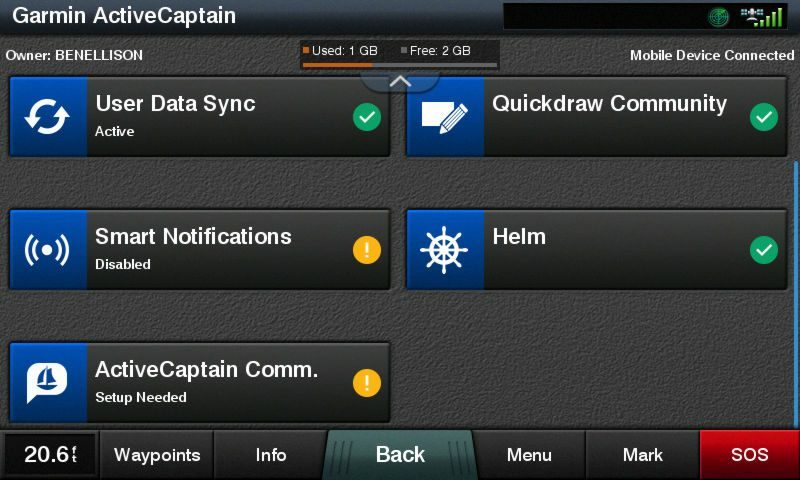 Garmin, who acquired Navionics in October of 2017, has announced that ActiveCaptain Community data will come to the Navionics Boating App by the end of 2018. We don’t yet have any information regarding display versus editing capabilities but will keep on the lookout for more information from Garmin and Navionics. Nobeltec’s CTO, Iker Pryszo, says they plan a staged roll-out of their software products with support for display only coming first followed by an update to allow editing. Nobeltec notes that the new API requires users login to their Garmin account via a web page launched within TimeZero and that’s not something that integrates well with their application. Ben Ellison’s testing of TimeZero found that after the 5/23 change to the ACC API updates are failing (which is expected) and that he now gets a message to login to ActiveCaptain when tries to view any AC POIs (I don’t believe that was expected). The products in this section have announced they don’t currently have plans to support the new ACC API. Some of these developers have publicly stated they’re considering support while others have been more final in their announcements. I think these developers do deserve some credit for clearly communicating their intent to their users. 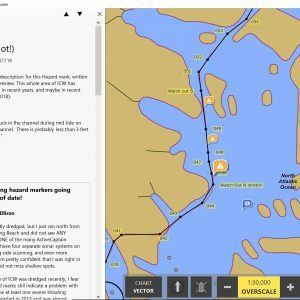 Garmin has removed ACC support from HomePort and published a support article pointing users towards the ACC website. For those who used HomePort for route planning the ACC website won’t be a suitable replacement until Garmin brings back the route features to ACC. For many, Polar Navy broke the news about the changing ACC API when they made this announcement: “We have been notified by Garmin, owners of ActiveCaptain, that ActiveCaptain data access will be discontinued on May 23, 2018.” It turns out that really wasn’t the whole story, but Polar Navy hasn’t changed their stance and continue to state they won’t be implementing the new API. SeaIQ has gone a slightly different direction. They’ve added support for Waterway Guide’s POIs to either augment or replace the ACC POIs. They’ve said, “We are considering updating SEAiq support for ActiveCaptain but do not have definite plans yet.” Until they decide differently downloading of ACC data stopped working on 5/23/18. We’ll keep an eye on announcements from SeaIQ to see if they decide to add support back to the app. I’ve been a part of many similar API rollouts in different industries. The approach Garmin has employed isn’t the preferred method of rolling-out of a new API. Ideally, the new API would be released in a testing or staging environment for a couple of months or longer. Once successfully proven in a non-production environment it would be moved to the production environment and run in parallel for several more months. This would allow the transition to the new API to happen in a smooth manner with an easy rollback in the event of troubles. I suspect Garmin didn’t have that option because of the hard deadline GDPR presents, the amount of development required, and the relatively late start they got having purchased ActiveCaptain right around a year before the GDPR deadline. The new ACC API has been released for about a week and much of that time was the Memorial Day holiday weeekend in the U.S.. I’m hopeful that over the coming weeks and months we will see the ranks of apps supporting ACC data swell. The two packages fully supporting ACC data, Aqua Map and Coastal Explorer, are two very strong offerings and if your needs include immediate support of ACC data I wouldn’t hesitate to recommend them both. If your current app of choice doesn’t currently support ACC data I believe there’s reason for optimism. The entire community has been waiting to see what Garmin will do with ActiveCaptain Community. It appears to me they’ve shown they’re committed to the product and with the decision to allow data to be downloaded without any login they’ve made it easier to get and use ACC data. We will keep watching the ACC partners for news of additional support for the new API. I plan to update this article as other apps add support. 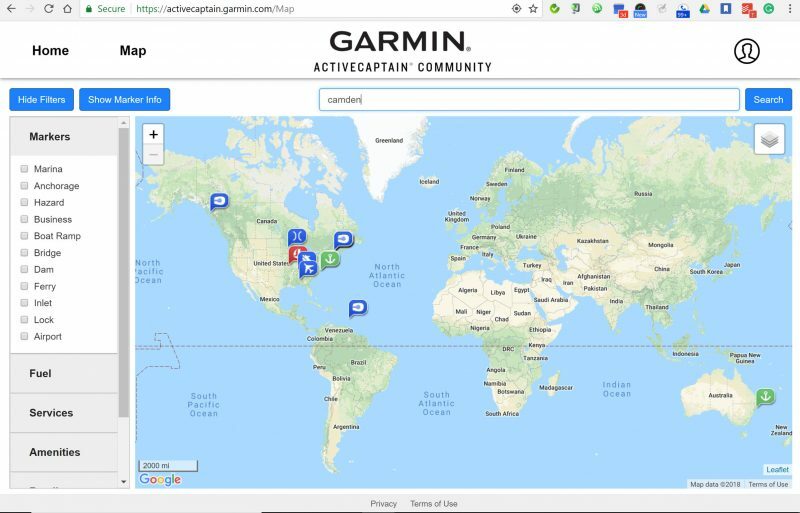 Previous story Garmin’s new ActiveCaptain Community site, what’s good and what’s not? Note that Garmin Active Captain is not compatible with older iPads, only versions that handle the latest OS. Garmin confirms they still have some work to do in order to resolve the issues with syncing for both BlueChart Mobile and Garmin ActiveCaptain. Hopefully sometime next week the issues being experienced with those two apps will be resolved. It is incredible to me the complete lack of clarity on Garmin’s part. They acquired an expensive asset and can’t seem to share direction. Who is the voice of Garmin Marine? Their blog has no identity other than Garmin. 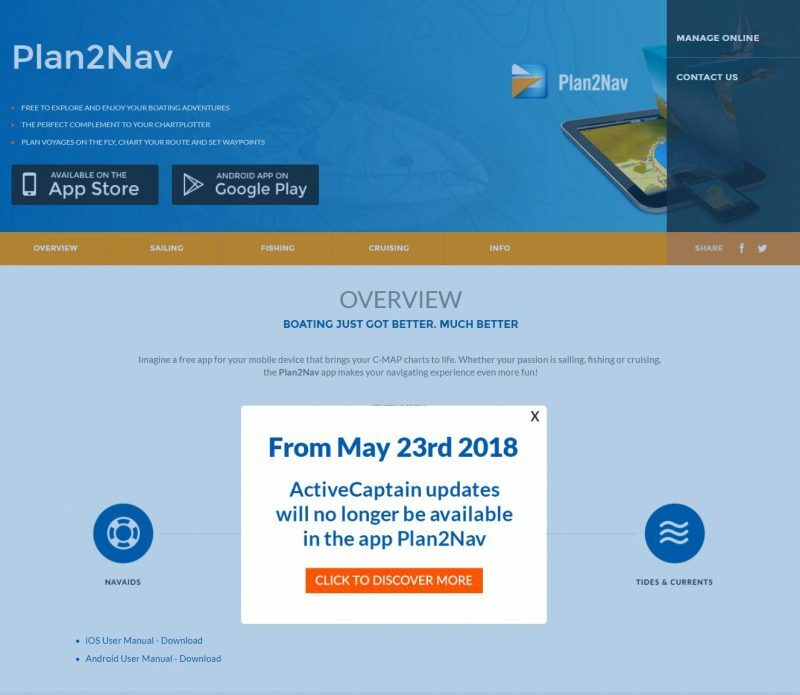 During the month of May there were zero updates on Active Captain when there was a its coming blog in April. I really thinkGarmin has amazing engineering but they simply don’t know how to engage the community! Users who loved BlueChart are lost and unsure. And the silence from Garmin is deafening. You can add MX Mariner to the “Display coming soon, editing to follow” category. I’m currently working adding support for ACC display in MX Mariner. And, will follow up with ACC edit support. I like to look at the bright side. It seems that right now, the only way that anyone can access or edit fresh ACC info while not connected to the Internet is to use Aqua Map or Coastal Explorer. Moreover, neither the ActiveCaptain App nor the old BlueChart Mobile — i.e. Garmin’s own apps– are slated to permit offline editing. In other words, it’s really hard to see how all the fears about Garmin keeping AC to itself and/or monetizing it are coming true. 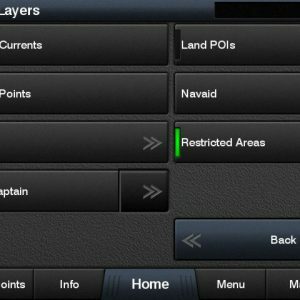 I’m sure that the AC app and BCM will be updating correctly soon, and AC is coming to (Garmin’s) Navionics Boating app sometime in 2018, but right now the third party developers have a good chance to win the hearts and typing fingers of ACC fans. Ben – I envy your “glass half-full” interpretation of the situation. I’m trying to stay optimistic as well. I’ve got a literal boatload of Garmin hardware and want this all to succeed. The missing piece to the puzzle is the input of Garmin’s product manager for AC. He should have a blog and publish updates weekly just as Jeff Siegel used to do. I realize that this may be a stretch for the Garmin corporate culture but they should bite the bulletin and learn from companies that do this well like Microsoft. This rollout is still messier than I’d thought it would be. As of today, June 4th, Garmin Active Captain app on iOS is still not able to sync to the database. Last dataset you can get is may 21st. WilhelmSK has added support for the new ACC API! The app didn’t support the old API so this is the first expansion of support we’ve seen. Still waiting to see the first Android app supporting the new API but I’m hoping we will see that soon. This just in. Yesterday’s (6/11/18) update to the iOS ActiveCaptain app claims to upload AC community data to Garmin ChartPlotters. I’ll be doing some testing this coming weekend to verify if this is so. If True, this will mark the first time to my knowledge that the community data itself has found its way onto the actual MFD. 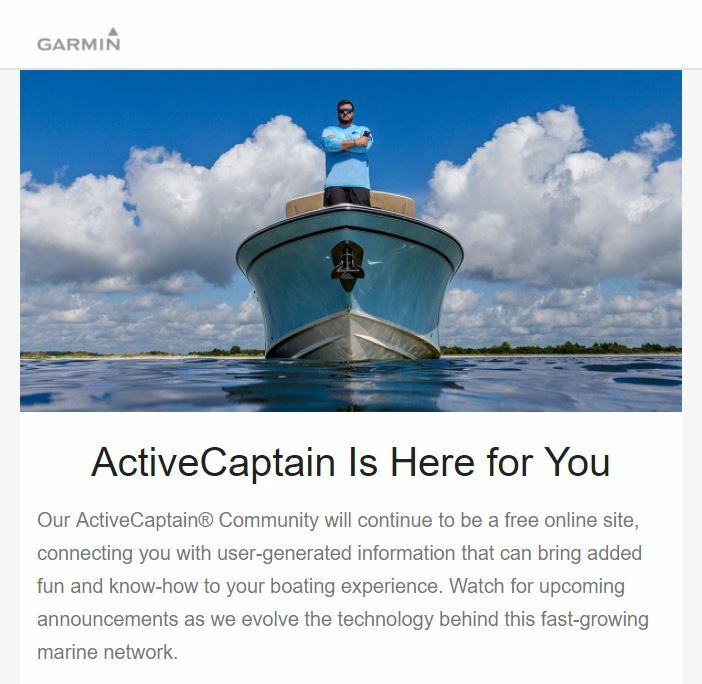 Garmin sent an email today (6/13/18) to the ActiveCaptain mailing list updating users on the status of the new ACC launch. The email acknowledges there are problems signing-in and updating both ActiveCaptain (the app) and BlueChart Mobile. Garmin goes on to apologize for the inconvenience and targets Monday 6/18 for a fix. They also remind users that because of the privacy changes they had to make for GDPR they’ve permanently removed ACC support from HomePort. It’s strange that Garmin didn’t use that email blast to announce ACC support on most of their MFD’s, but what I saw listed in the v12.00 update is for real. Gizmo’s Garmin 7612 and 742 displays are both showing all ACC markers and data quite nicely after this morning’s update. More to come. It looks like Garmin is making progress on updating ACC data for their apps. Garmin ActiveCaptain (the MFD companion app) is working now, I show data updated 6/22/18 at 10:32am. BlueChart Mobile is making it further than it was before. It now downloads data for a while before reporting the update was interrupted. Garmin has sent an email informing users that they will need to log out of ActiveCaptain in BCM, delete the old data, and re-download the data. I’m about 15 minutes through and it looks like the process is working. Happy to report that the ActiveCaptain app on my iPad updated ACC data properly this morning, and that it it also synched nicely from the app to Gizmo’s Garmin MFD network. I know for sure that the data is current because an unnecessary Hazard maker I deleted very recently at the ACC website is also gone on the MFDs and in the My Chart section of app. The whole process took just a few minutes, even underway with a modest cell connection. This makes them the second iOS app to pick up Waterway Guide’s database. Aqua Map seems to be pretty close with an Android version that supports ACC but for now it still appears the Android crowd is left out of the ACC fun. Hi Ben S! 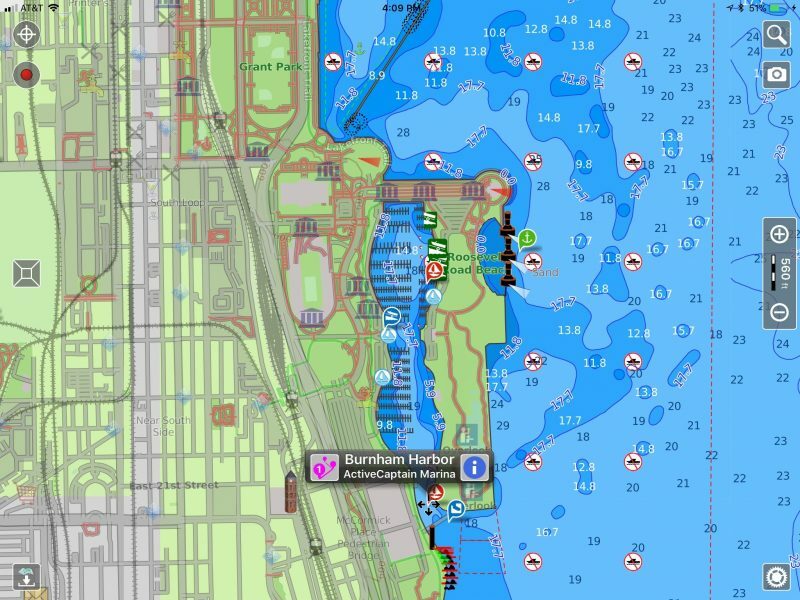 I bit the bullet and bought Aqua Map for my iPhone — WONDERFUL! Works a charm, and once you get used to maneuvering around the screen, almost as good as a full-size laptop. For ease of use, it eclipses iNavX completely. Note that I generally use it for exploring ahead, not for real-time navigation (though that mode works fine). It has both AC and Waterway Guide markers, so lots of info. A followup regarding Aqua Map – I had identified a problem with some current stations (the three in the Cape Cod Canal were depicting flows of 12-15 knots!) and sent them an email. They confirmed a problem, which they said was fixed for those three, and would be eliminated with the next version, due out soon. Bravo! Aqua Map has now released the Android version with ACC support. They’re currently the only app I’m aware of that supports ACC on Android (except for the MFD companion Garmin ActiveCaptain app). I would agree with you, Ben – while “Kayley, Seattle” is clearly the result of someone posting copied stuff on AC, blaming AC management for it seems pretty lame. 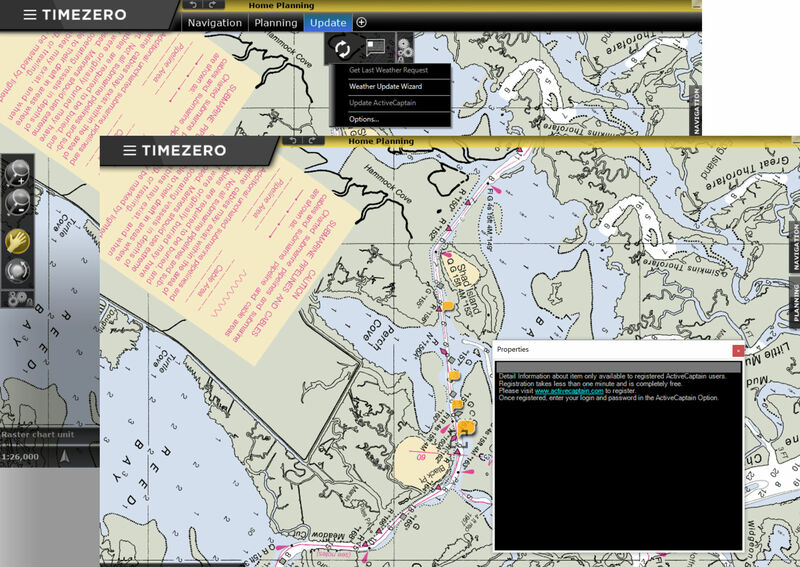 Both versions Nobletec Timezero Pro and Navigator work well with latest update. 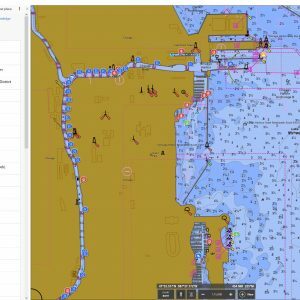 Many months ago, Garmin announced a new version of Homeport that specifically would not have Active Captain data capabilities. I had the previous version (2.2.10) so I did not upgrade. I was told at sometime, Garmin would have a new Active Captain data structure that would not work with old (like my) versions of Homeport. I keep plugging along with version 2.2.10 and it keeps syncing Active Captain.. at least it says it does… so to test I got on my droid phone and launched the droid-based Garmin Active Captain and I made a review of a local marina. I then (within an hour) went to my PC-based Homeport, did a sync and then looked up the marina. I did not see the review I had just made on the phone. So on the Pc/Homeport (version 2.2.10) I made the same reviews and, Wela, it appeared on the review tab in Active Captain on Homeport. I should have gone back to my droid to see if it was there but I did not. I do not know if the review I made on the PC/Homeport was cached on my PC or if it actually went to Garmin for others to see. I did some looking around at other local marinas and I saw no updates/reviews closer in time than from about June 2018. If someone can tell me a specific marina in a specific US location that they updated within the past week or so that would be great. I would sync my PC/Homeport and see if this new AC data is truly coming through or if I am just seeing old AC data and AC data I created that is cached on my PC/Homeport. One last thing, I ONLY sync in Homeport. There is an option to rebuild the entire AC database but I dare not do that for fear I would lose even the old AC data. I just edited that sentence on my desktop computer at the AC site and know that it synced to the database because I can see it in the AC app on my iPad. Also in Camden Harbor, Check Lyman-Morse marina for a review by GarryH dated 8/29/2018. It would be nice if Homeport is supporting AC again. Ben Ellison… thanks… I just checked that POI in Homeport 2.2.10 and I see your edit…. Apparently Garmin never turned off AC updates in the older Homeport software. Glad to hear, but I’m confused. In June they changed the structure of the AC database and that meant all existing programs could no longer access the AC data. It wasn’t a case of turning it off; it just didn’t work anymore. Here’s my *GUESS* as to what is happening here. Garmin has explained previously they controlled the update mechanism for Blue Chart Mobile even when AC was an independent company. They did this by downloading AC data to a Garmin update server then providing this data to BCM clients looking for updates. I’m thinking they did the same thing with Homeport (and quite possibly even used the same mechanism and servers) so old versions of Homeport are still able to get updated data. If Homeport follows the same mold as BCM it’s likely the updates you make aren’t going anywhere and there’s no mechanism to let you know about these dead-end updates. Garmin majorly changed the update and new POI process in the new API and I don’t believe there’s any possibility of translators or converters like what is in use for the data download side. “The First GPS Epoch ended August 21, 1999. We are currently in the Second GPS Epoch and will be in the Third GPS Epoch as of April 6, 2019. Most GPS units will handle the rollover OK Other units may not deal with it, and end up providing error messages or inaccurate data. If date-time information displays incorrect after April 6 2019, it may be necessary to either replace the system’s GPS sensor, add an external GPS sensor to the system, or replace the GPS sensing device (should no software/firmware update be available to address the 2019 GPS Week Rollover event). Contact your GPS Manufacturer or visit its website, to see if your model is affected and what steps to take, if any.